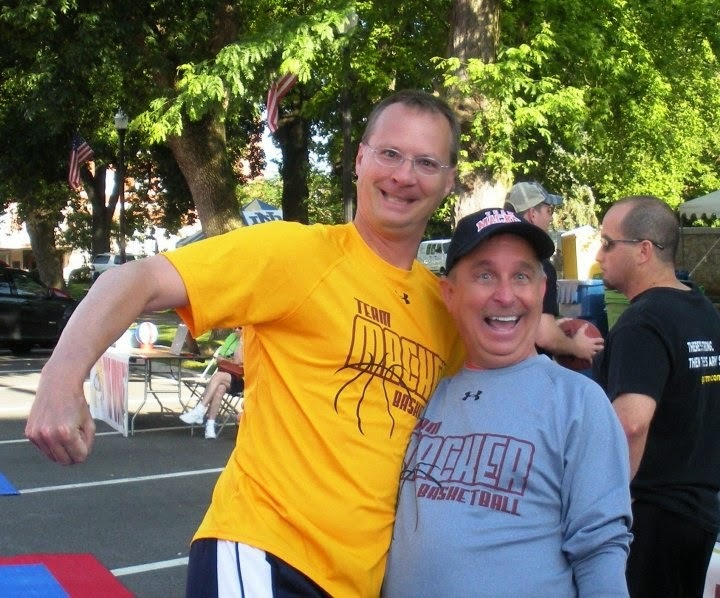 GUS MACKER IS back for the 25th time in Quincy. This weekend's annual 3-on-3 basketball tournament is one I always look forward to, and I always have fun. I worked my first Quincy Macker in 1997. I believe there were around 1,500 teams. Not players, TEAMS. It was one of the biggest tournaments in the country. I was a Gus Buster on a high school boys court on Maine Street, and the parents were lovely. I remember on Sunday afternoon a parent got on my case about missing a call at the other end of the court, so I calmly went up to him and said, "No more. Don't. DON'T." I think he was actually afraid. He shut up, and his kid's team went on to win. A year later I actually got bumped by a mad grandfather after I warned him for using abusive language. I had the last laugh - he got cited for battery and eventually had to pay a hefty fine in court. It's one of few bad things I remember about working for Gus. In the late 1990s I worked the top high school girls courts, on Fifth Street right in front of our store. Gosh, those were battles. Quincy had some really good players back then and I think their girls usually won. I remember the Monroe City girls were gamers and hung in there against taller players. Emily played for many years, then was a Gus Buster for a few tournaments. I was especially proud of her when she put a heckling parent in her place. Just like her old man, she wouldn't tolerate foolish behavior. My favorite tournament was 10 years ago. I was assigned to work the Dream Court, where youth teams are placed from their regular courts. It's played on a special surface, there are announcers and starting lineups, and when Gus Macker founder Scott McNeal did play-by-play, I often had trouble blowing the whistle because I was laughing so hard. This was less than a month after my mom died, and I was really down and depressed. Dream Court helped pull me out of the doldrums and have fun again. I still officiate games on Dream Court. I have to literally step out of my door at Second String Music and walk about 10 yards to the court. It is a dream. I love it. The music store is open late Friday, all day Saturday and also on Sunday this weekend. We really do love our Gus Macker. Come by and see the side store (the old Dancer's Dream) set up to sell snacks and drinks too. Let's have more fun this weekend!